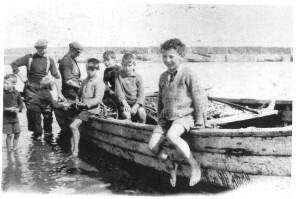 Those who went down to the sea in ships, be it cobles, yawls, motor boats or schooners, did so at great risk, especially in winter time, in common with other fishing communities the Seaboard villages had their share of accidents at sea. In 1912 the Ella Brewster, a yawl, was so heavily laden with mussels gathered at Fort George that she floundered on the way home. All the crew were drowned save one, Alex. Mackay. In stormy weather Balintore harbour can be very difficult to negotiate and in 1928 a life was lost just outside the jetty. 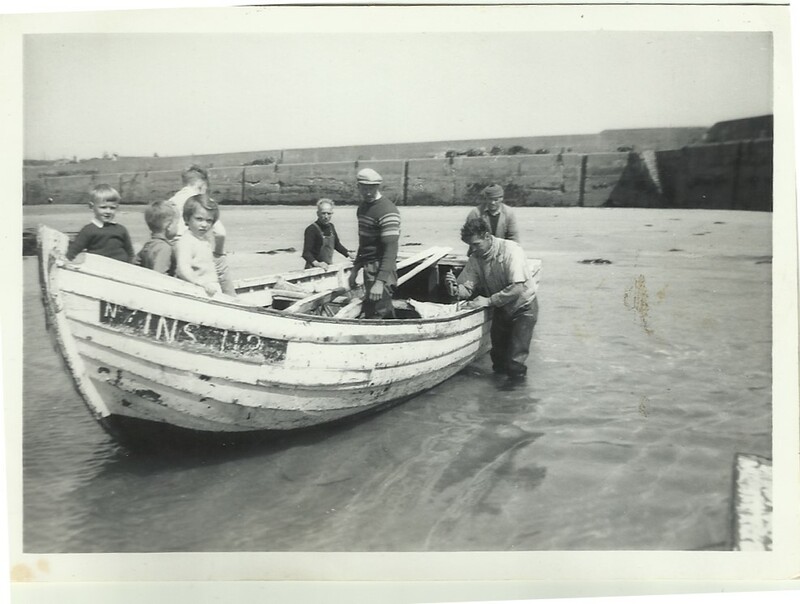 The motor boat Pearl was used for towing salmon cobles and on one such occasion Pearl and a coble she was towing were waiting outside the harbour for high tide in order to come in. While waiting a sudden storm caught the crew unawares and pulled the anchor, the crew had no option but to tie the boat to the head pole of a nearby net. The storm grew so bad that John Paterson got the crew of the motor boat Thrive to go to the rescue of the Pearl, Mr Paterson going with them. They circled Pearl and threw a rope to her crew which missed first time but succeeded second time round. They towed Pearl and the coble and were just getting into the safety of the harbour when tragedy struck. It seemed the big waves were coming in sets of three and as the Thrive came in on the third wave the rope snapped on an unexpected fourth wave, the result being that Pearl was driven straight on to the rocks at the side of the jetty and wrecked. One of the two men on board, David Skinner, realizing the imminent danger, leaped into the sea and managed to get to shore. The other, Tommy Vass, was trapped and drowned. The skipper, Hugh Mackay, was presented with a Royal National Lifeboat Institution medal in London by the Prince of Wales, and the rest of the crew, John Paterson, Andrew Sutherland and William Ross received recognition of ‘courageous conduct in putting off from Hilton, Ross-shire, in a motor boat with four other men and at great personal risk rescuing one of the two occupants of the motor fishing boat Pearl which was wrecked in a gale with heavy sea’s at Balintore on 20th March 1928.’ The crew of the Thrive also received certificates from the Carnegie Heroic Trust Fund in recognition of heroic endeavour to save human life. With many men joining the Royal and Merchant navies it was fairly common for families in the villages to lose their loved ones far from home. One family in Hilton lost four generations of their eldest sons away at sea, other losses occurred very close by. Two young fishermen who fell victim to a hungry, cruel sea were Finlay Vass and Robbie Cha (Roberston and Charles Wood). The former was drowned outside the harbour and the latter was dragged into the sea by the anchor of a coble. These are but a few examples of the Seaboard villages maritime fatalities, there will undoubtedly be many more cases involving loss of life at sea that are yet to be documented. The King’s Son’s reef is submerged at high tide, this led to the loss of a ship from the Orkneys bound for Cromarty around the year 1790. The disaster happened on a fair evening as the ship strayed to close to the shore. The crew managed to save themselves but could not save the ship which was subsequently lost to the sea. In the weeks that followed the disaster locals from the Seaboard villages could still see the mast of the wrecked boat protruding from the waves. The king’s Son’s reef claimed a further victim around 1896 or 1897, an Inverness vessel known as the Leoramundo. In Balintore cemetery lies the gravestone of Samuel Woodford and his son Henry James, lost on the reef in January 1897. Their ship is not named and they may possibly have been from the Leoramundo. The big ship that was sailing the oceans, She came in one gloomy night, And she was lost in the darkness, And the storm threw her into Cadboll. She remained there for a time without moving, As a broken vessel amongst the hard rocks, And some tried to lift her up, And tried to lift her up and tried her on the ocean, and to work with her. An interesting little story has come to light in recent years linked to the first wreck of the Linnet Mhor. It seems that when the ship was driven onto the Cadboll rocks, some timely help from Hilton, the nearest village to Cadboll appeared. 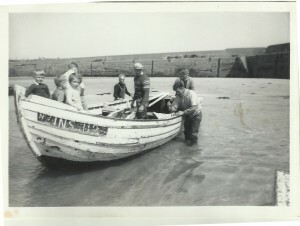 The locals rescued the crew and did their best to effect temporary repairs before sailing her to the nearest port, either Balintore or across the Moray Firth to Spey Bay. Unfortunately, lacking both anchor and rudder the ship was doomed. A strong wind blew in leaving the ship in a perilous position, the Linnet was sunk along with her crew. One of the fishermen from Hilton who went to the help of the Linnet was Finlay Skinner. In gratitude for saving his life, the captain of the Linnet gave Finlay Skinner a gold ring inscribed S.S. The ring has been handed down through the generations of the Skinner family, at the present time it is the possession of Mrs Beth Skinner of Balintore who is a fifth generation Skinner. The owner must be a Skinner and if female, named Sophie.